The Nautilus T618 is the newest model in the lineup, joining the T614 and T616 in the entry level category. Although it is a nice improvement on those models, the sub-par warranty is a little off-putting. The T618 console features two blue backlit LCD windows showing you your workout stats such as distance, time, speed, incline and more. 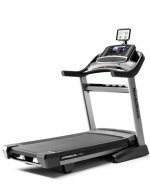 The Nautilus T618, sometimes referred to as just 618 without the T, has been the most well reviewed of all of the company's treadmills thus far. It's the newest model they offer also their top offering in terms of features and capabilities. The T618 is a beefed up version of the T616 treadmill, with a stronger motor and higher max weight capacity. You get a strong yet virtually silent 3.5 CHP motor and a 20 x 60" 3 ply belt, plenty of room to stretch out during a run. There is the patented Rebound Cushioning System, which provides the ideal amount of support at each point of your stride, minimizing impact on your joints. It is a bit more advanced than the Strike Zone cushioning on the T616 model. You get up to 15% incline and up to 12 mph speed, both of which can be adjusted on the handrails. 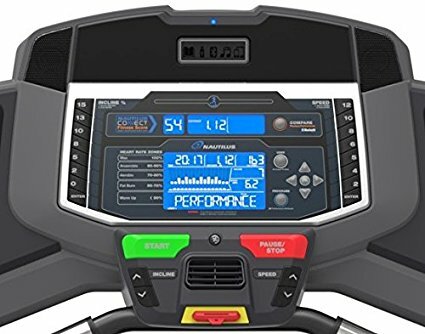 The dual window console offers up all of your workout information, which can be synced via Bluetooth to Schwinn Connect and then integrated with many popular fitness apps. The T618 has a large amount of built in workout programs, 26 in all, including everything from heart rate to weight control to intervals. So there's plenty of diversity, allowing you to change things up from one workout to the next and challenge yourself. Any negatives? Besides the console, which is pretty basic for a higher end treadmill, the warranty could be much better than it is. Although it is superior to the one given with the T614 and T616, it's still only 15 years on the frame. 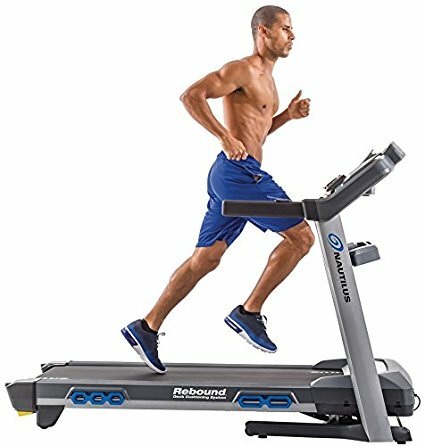 That may sound like a long time, but most treadmills these days come with lifetime frame coverage, especially those in this price range. Still, there's plenty here to satisfy even the most demanding runner. Although it does have a lot of nice features, including incline capability, lots of workouts, a large cushioned deck and strong motor, we can't get past the subpar warranty to fully recommend the Nautilus 618. At around $1000, it's definitely affordable but there are better options out there from NordicTrack and Sole at that price point.